Gitti Lindner's charming handmade vase is a reminder to keep growing in strength and beauty. Gitti Lindner likes to add inspirational words or phrases to her clay creations. In the case of this charming handmade vase, her word choice can be taken as a noun—the blossoms the vase will hold—or a verb—a reminder to keep growing in strength and beauty. 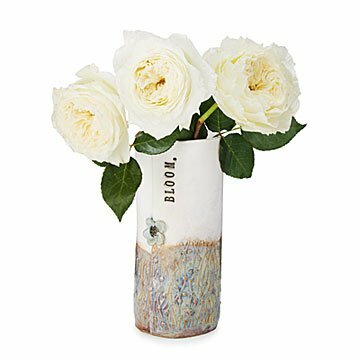 The rustic, slab-built cylinder features a combination of soft, matte white and iridescent, textured glazes, with one sweet blue blossom accent in the center. The inspiring design offers a backdrop to compliment any color bouquet. Handmade in Sacramento, California. "I love to take the spontaneous ideas that come to me throughout the day and turn them into clay creations," says German-born artist Gitti Lindner. "Sometimes what I see in my head comes out as a completely different physical piece, but that makes it even more exciting, because it's a surprise for all of us!" Gitti has pursued various artistic endeavors, from lost wax casting jewelry design to interior design. She has always created art, but found her passion in clay. The wonderfully tactile and forgiving quality of the clay opens up a vast world of exploration and allows for open creative expression. Gitti loves to create functional pieces that serve a clear purpose and are unique in their market. Her goal is to take everyday items that are normally very generic or made of synthetic materials and give them a fun, personal twist that’s not only beautiful, but natural and lasting. She usually adds a word or phrase that is either a fun idiom, a turn of phrase, or a word meant to inspire. Each of her pieces is handmade so everyone will have a one-of-a-kind piece of art. 7" H x 3" dia. This is such a lovely vase. This is a perfect little vase for a few flowers. Beautiful piece that can be used for flowers or other items. I got this vase for my home, and fell in love with it immediately. It is beautiful, elegant, very good quality. Would make a perfect gift. This is a beautiful vase that goes with any decor that my mom has. It's medium sized so the flowers aren't stuffed in, it looks natural with a few blooms. Bought this vase as a birthday gift for my mother. It's a beautiful and unique item, she loved it! My friend loved this gift! What a lovely vase! Already many comments on how cool this looks. It would be a fantastic gift!